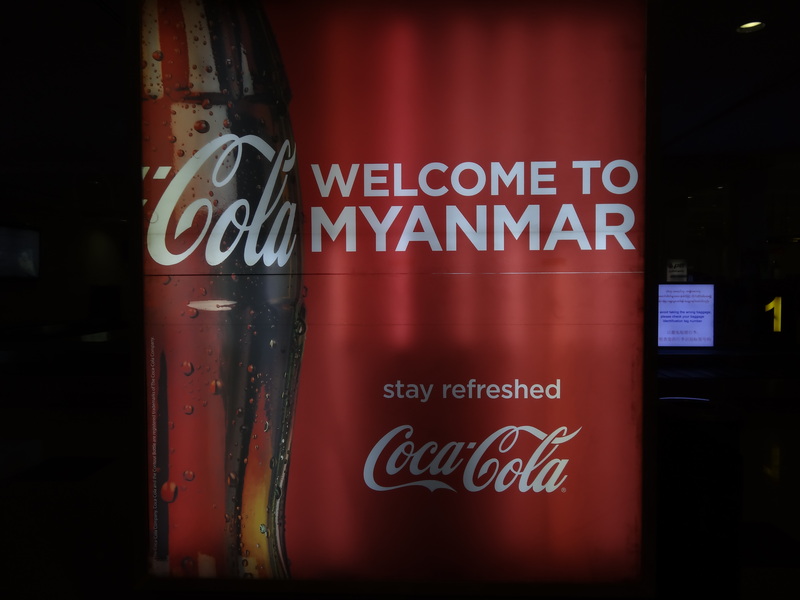 As soon as I stepped off of the plane in this far-flung former capital city, a Coca Cola ad which said “Welcome to Myanmar” was waiting for me. This ad awaits beyond customs at Rangoon’s international airport. Next, a blast of humidity hit my face. Finally, new and unfamiliar smells attacked my nose. At that moment, I knew I was about to embark on a memorable and unpredictable journey in one of the world’s final travel frontiers: Burma. 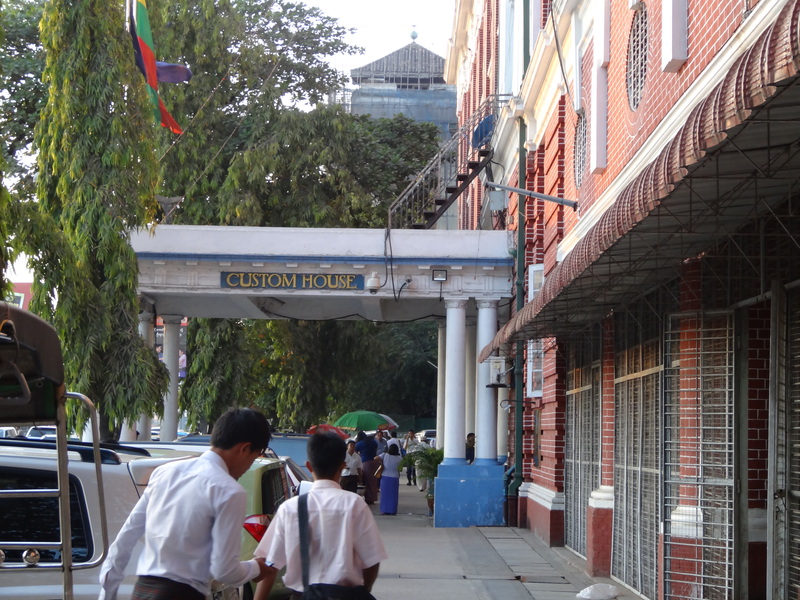 Of all the tourists I met during my time in Rangoon (and in Burma, as a whole), I never met anyone who went there for the same reason I came to Burma. 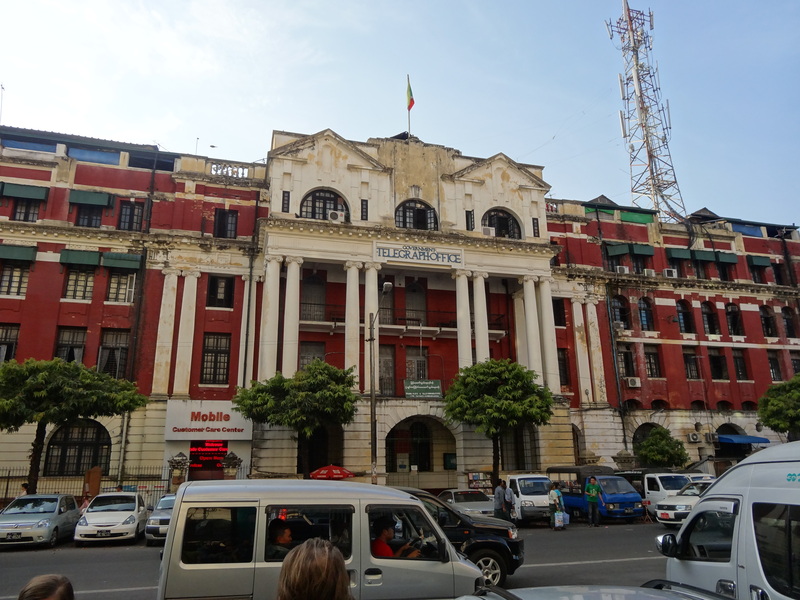 I came to see the final vestiges of the crumbling British colonial architecture and get insight into hat may have inspired George Orwell’s writings. 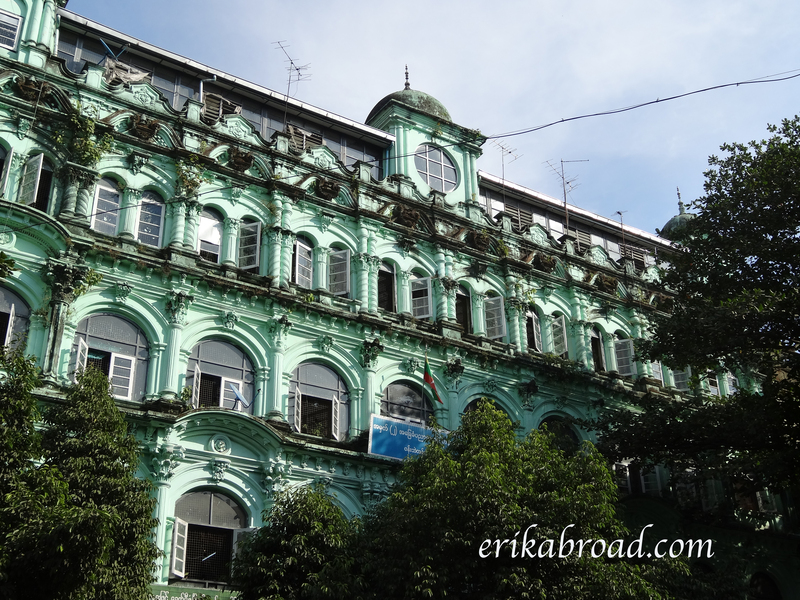 Sure, many people came to see architecture and buildings in Burma, but no one I met came to get lost in the city and see the fabulous early-20th Century colonial architecture. 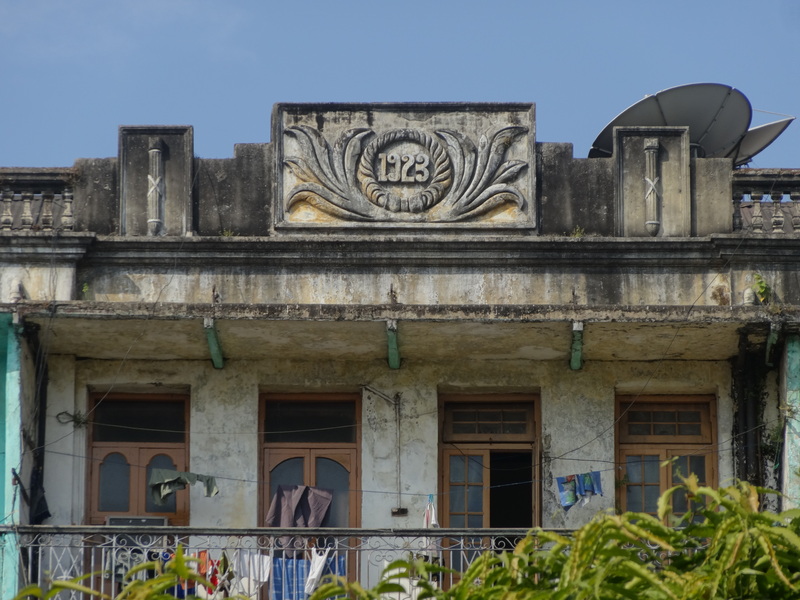 For them, Rangoon was an afterthought. 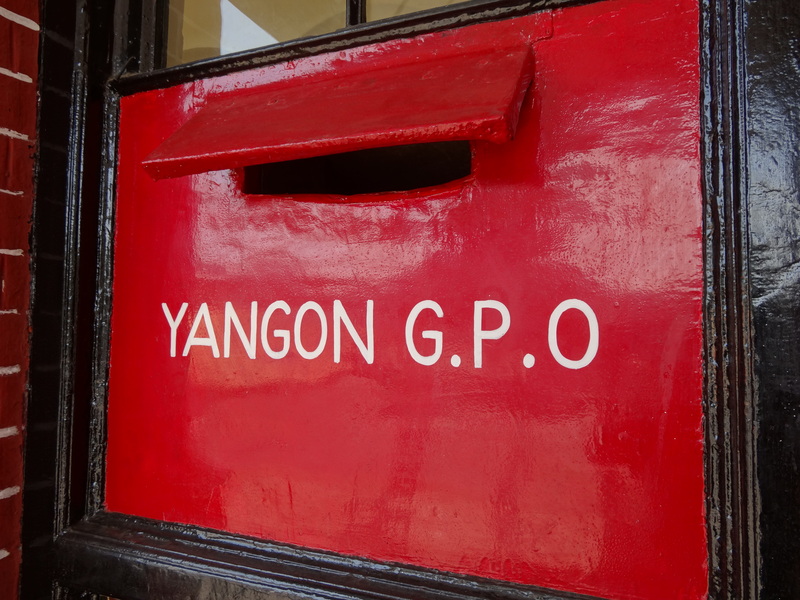 They wanted to get out of dodge and head to more famous, Buddhist-inspired, places like Bago, Bagan, and Mandalay as quickly as possible. But, really, who could blame them? 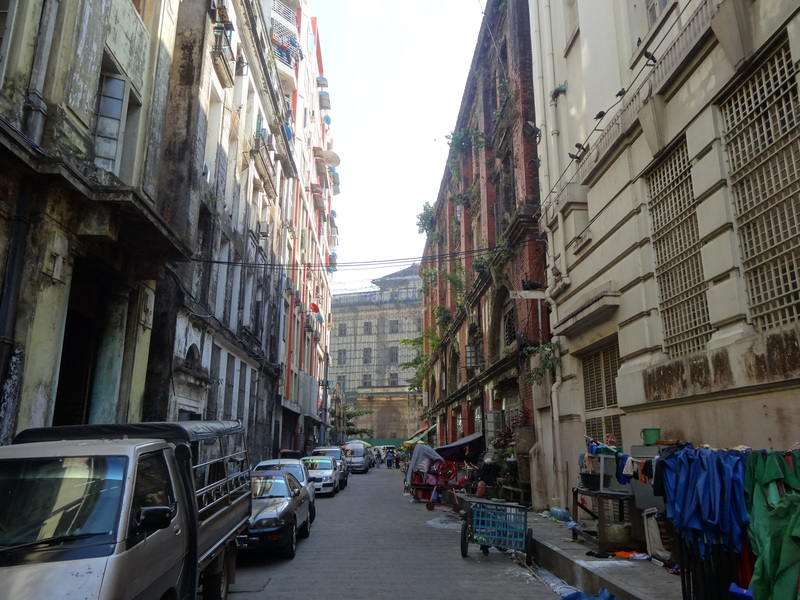 To the untrained and uninterested mind, Rangoon’s cracking streets, gritty buildings, littered sidewalks, congested roads, and filthy markets make the city just like any other place in Southeast Asia. How sadly mistaken those folks were. How could you pass up walking through a time capsule like this and imaging what it was like in the pre-WWII days? 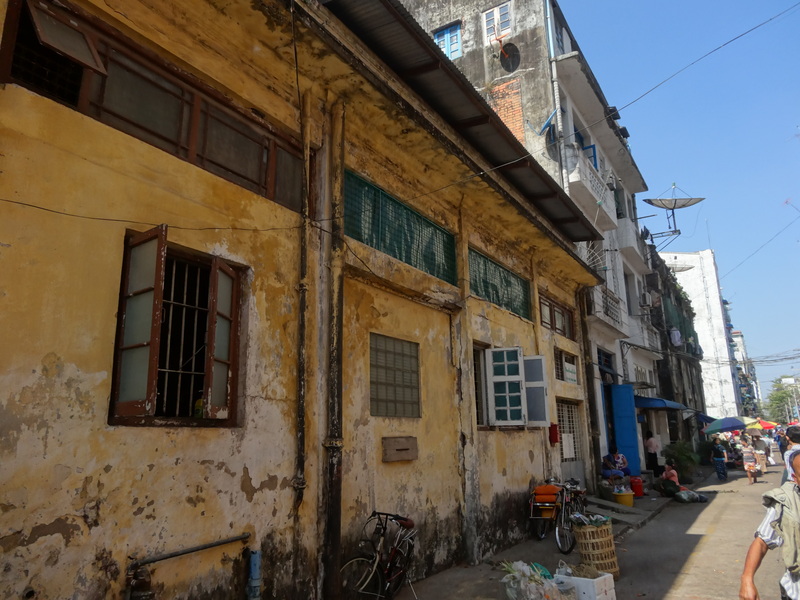 With trees growing through century-old masonry, grime caked on facades, and tobacco vendors criss crossing every which way, each street has its own character. 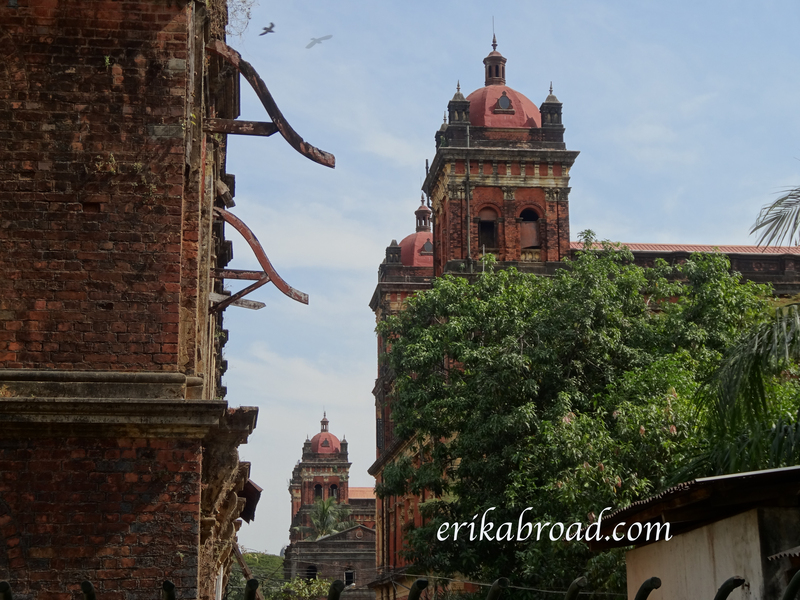 They missed experiencing and getting lost in the city with the world’s finest colonial architecture: Rangoon, Burma. 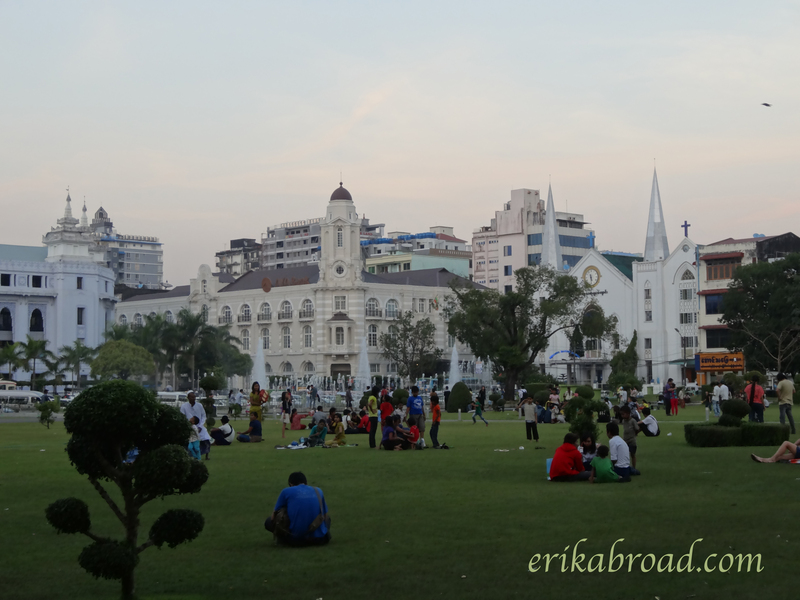 During my time living in Japan, I have been searching for travel destinations in Asia and Oceania where my American friends have never been, specifically those with a zest of colonial history and also rich native culture. 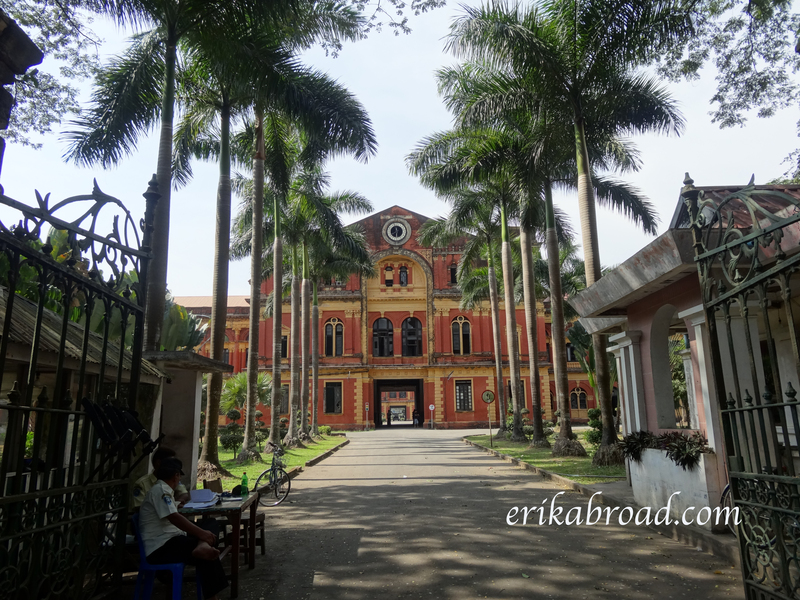 Once I read my first article about the street life in Rangoon and saw photos of the British colonial buildings, I KNEW it would be my next destination in the region. 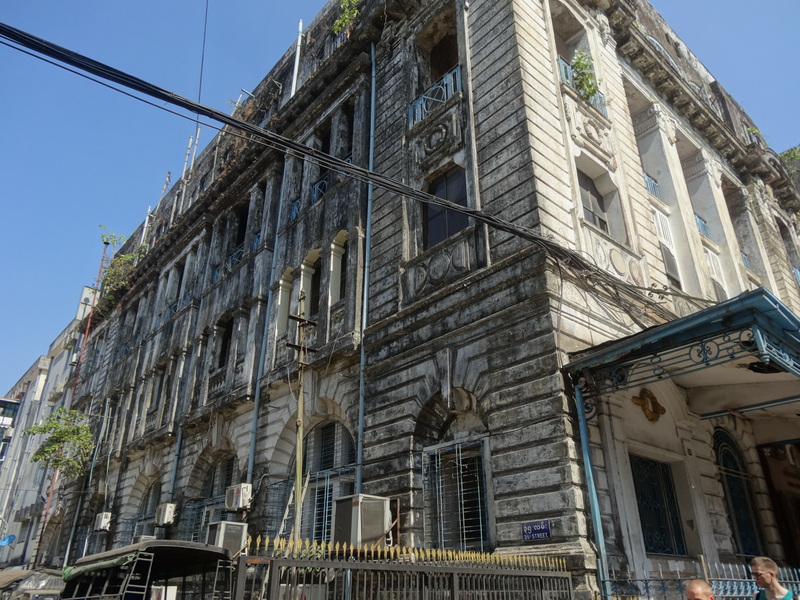 The more and more I read, it became apparent that the British buildings were falling into disrepair with time and were either being demolished or allowed to crumble to meet an untimely demise. 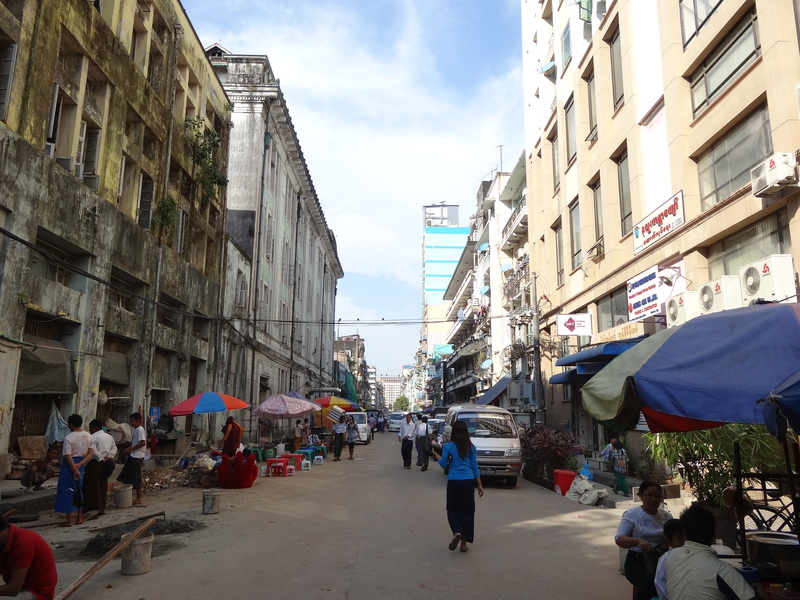 This winter, I trekked to Burma to ensure I could see these buildings before they met their ultimate fate. 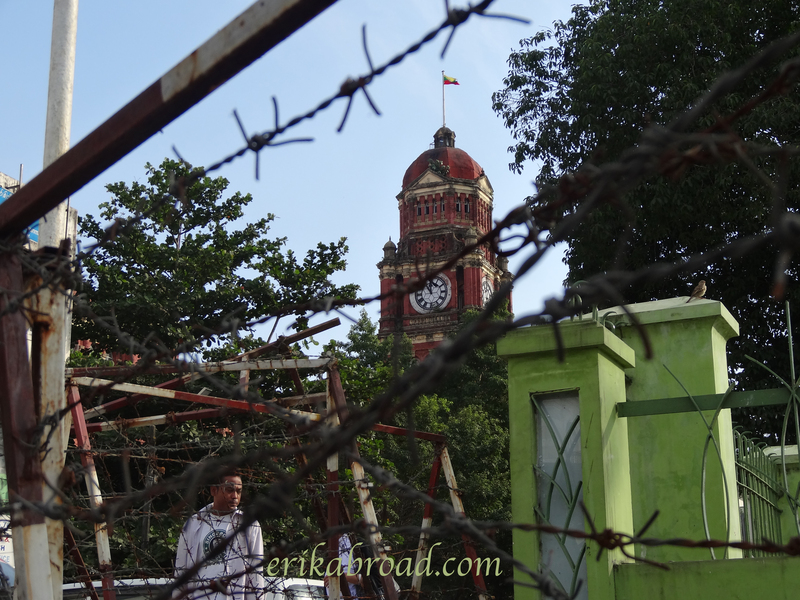 Either by neglect or by attrition because of the rapid growth in Rangoon, they could be gone very soon. 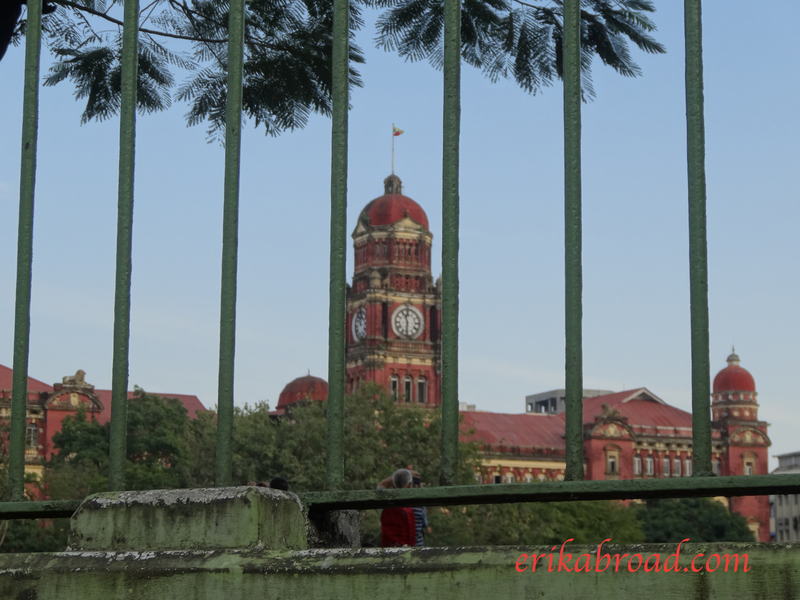 Here is my photographic essay on Rangoon. 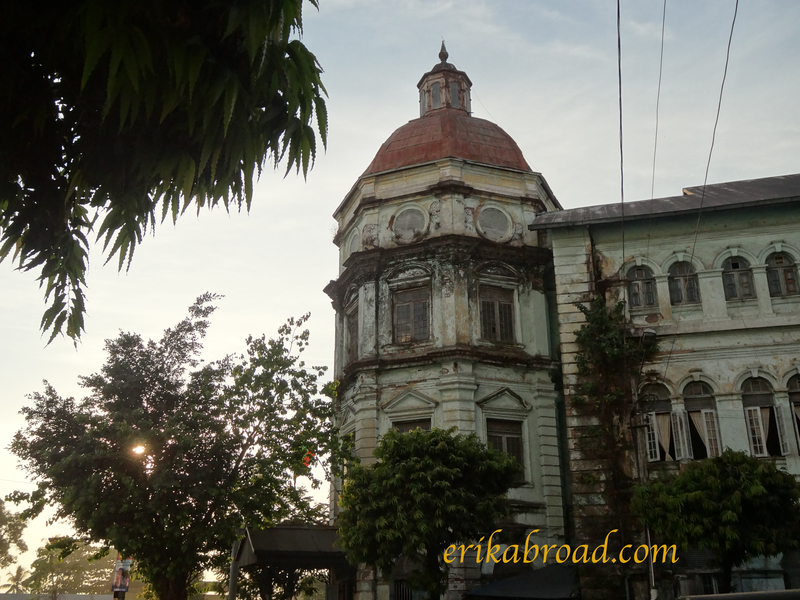 To date, I have not found such an extensive photo collection as this one dealing with colonial architecture. Please enjoy and provide comments and feedback. 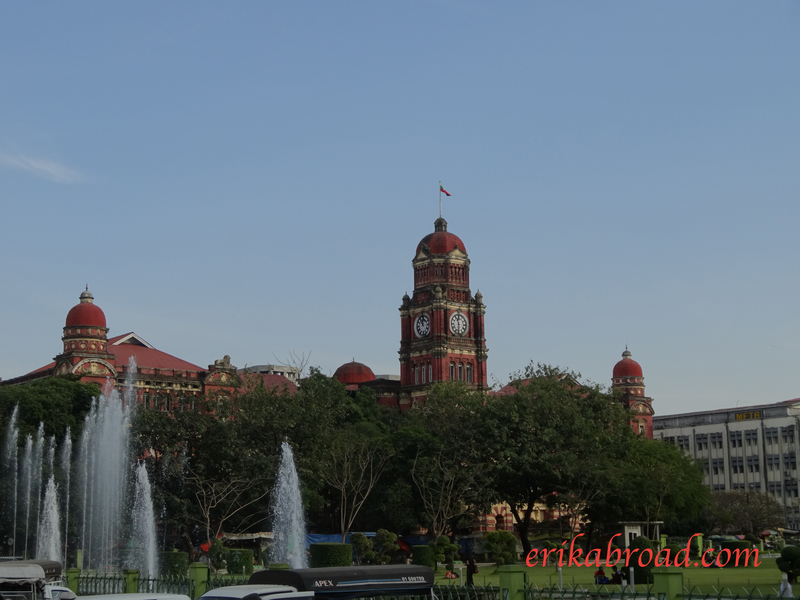 Due to upload restrictions, I cannot share even half of the photos I took. 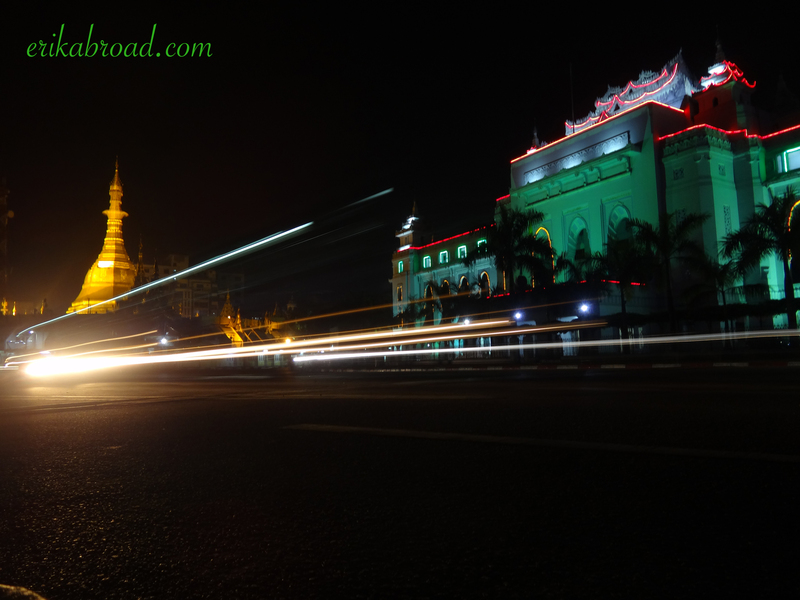 I arrived at my hostel on 30th Street, in the heart of the city, past midnight and quickly went to sleep after seeing a glowing Sule Pagoda in the distant night. I awoke with dawn, anticipating scenes of a bygone era. The early morning sunlight did not disappoint. 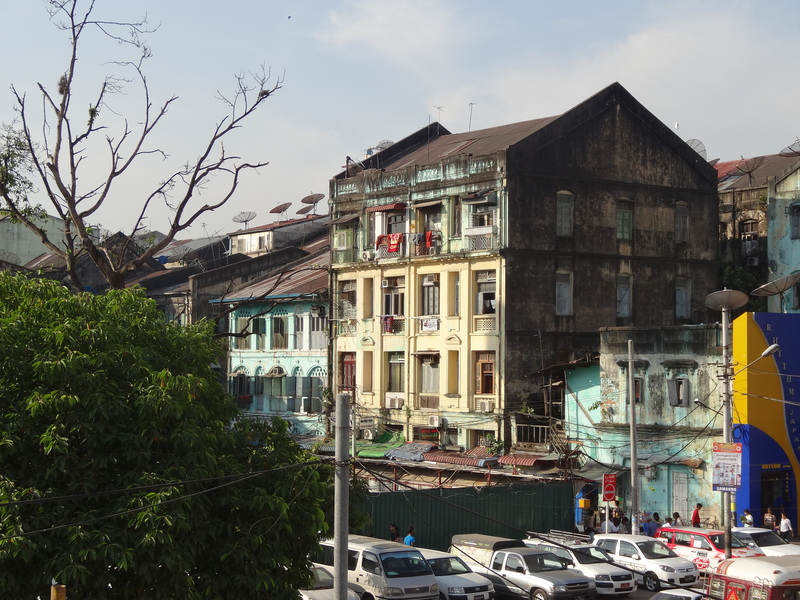 After making a quick right turn out of my hostel, I was bombarded with a unique scene: some restored colonial villas stood alongside other crumbling buildings while cranes raced to erect new, modern buildings. Catty-corner from me, even more colonial relics beckoned. 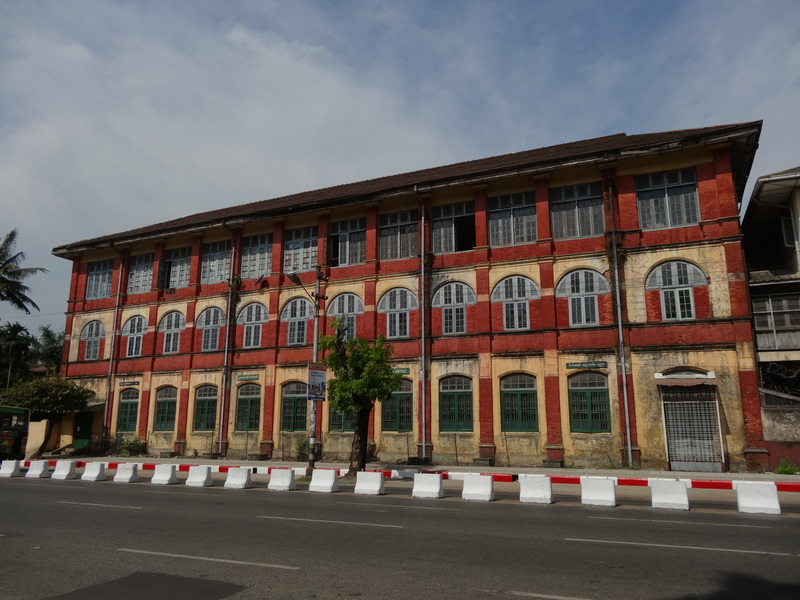 A former residency and trading building loomed large on the main road leading to the pagoda. 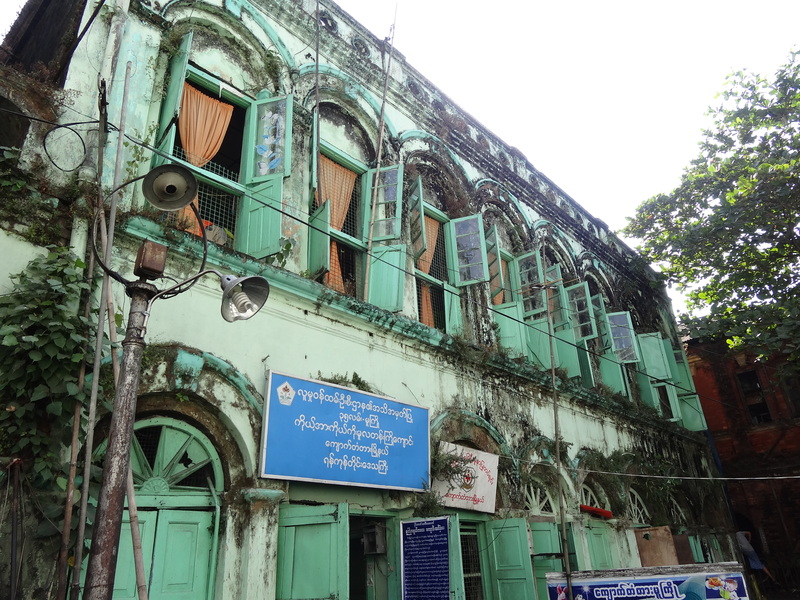 Worn with years of grime and coated with new, turquoise and yellow paint, I wondered if the Burmese had started to preserve some of these treasures before it was too late. 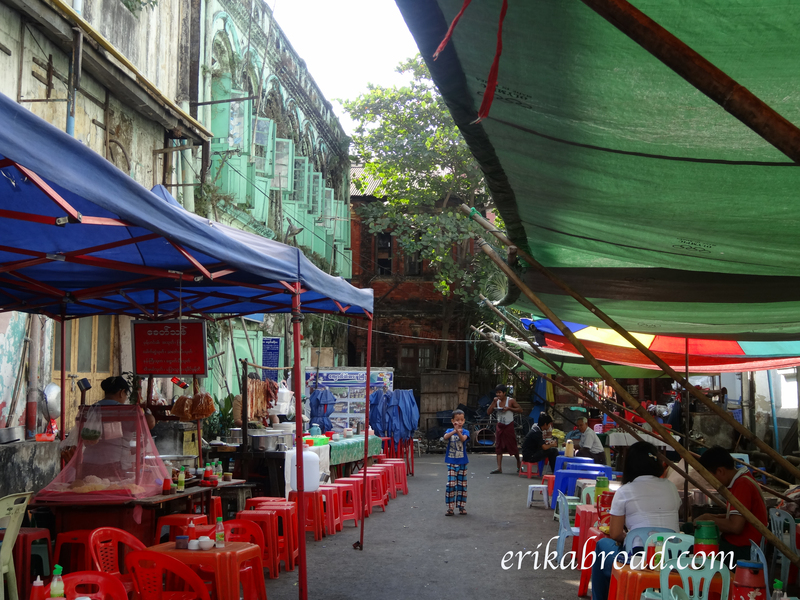 After this short stroll, I returned to my hostel and met up with my guide, James, to embark on a food tour of the city (more on that coming up in a later post). 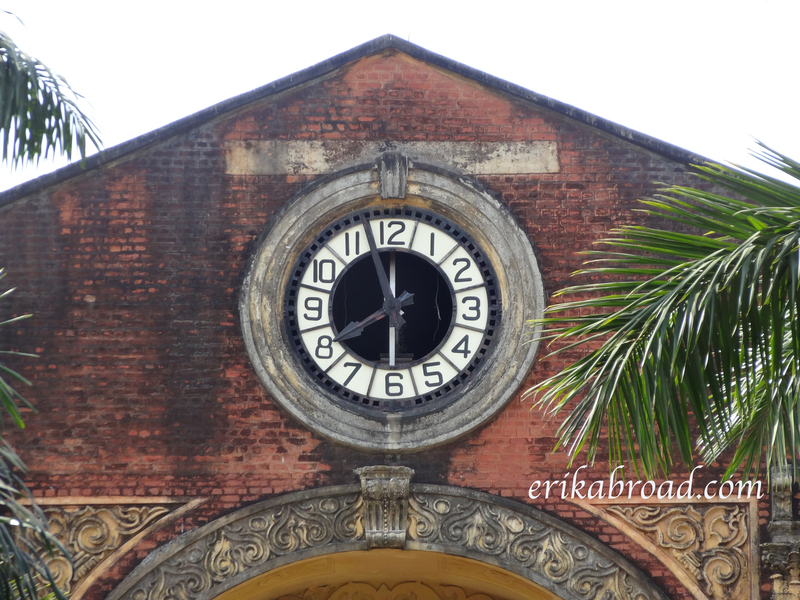 On this tour, we encountered even more fantastic colonial relics. 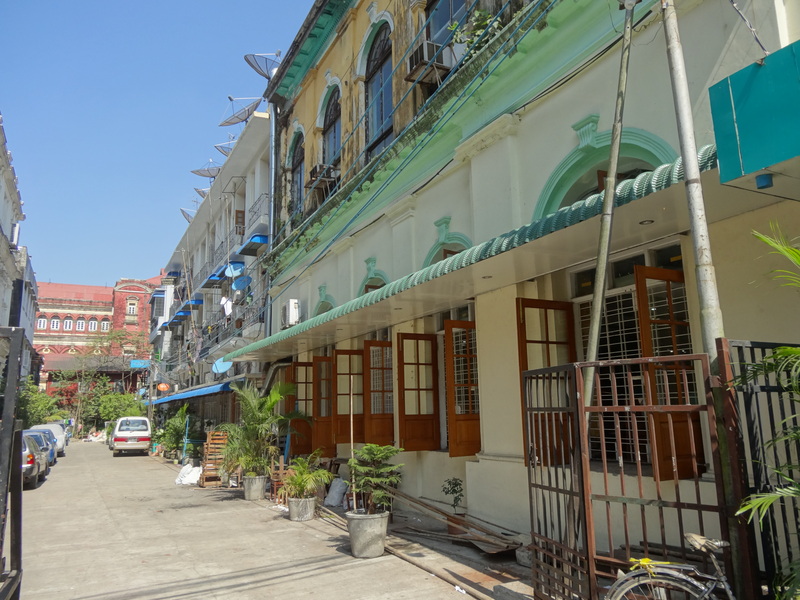 Ranging from former public schools, markets, and residencies, to streets filled with former hotels and bars, the British influence and architecture cast a large shadow as we walked through Rangoon’s maze of streets. Aren’t some of these images breathtaking? 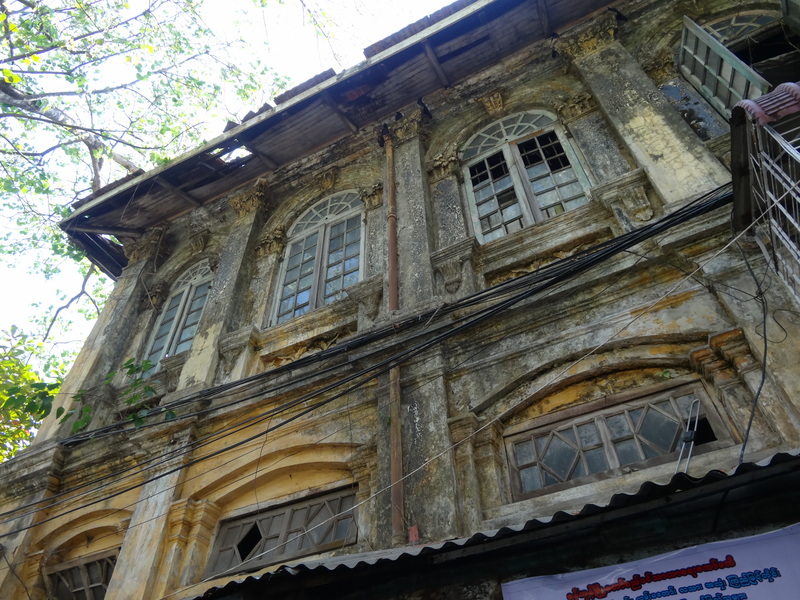 The ornate craftsmanship which creates the colonial version of the cornerstone juxtaposed against chipped paint is a sight to see. 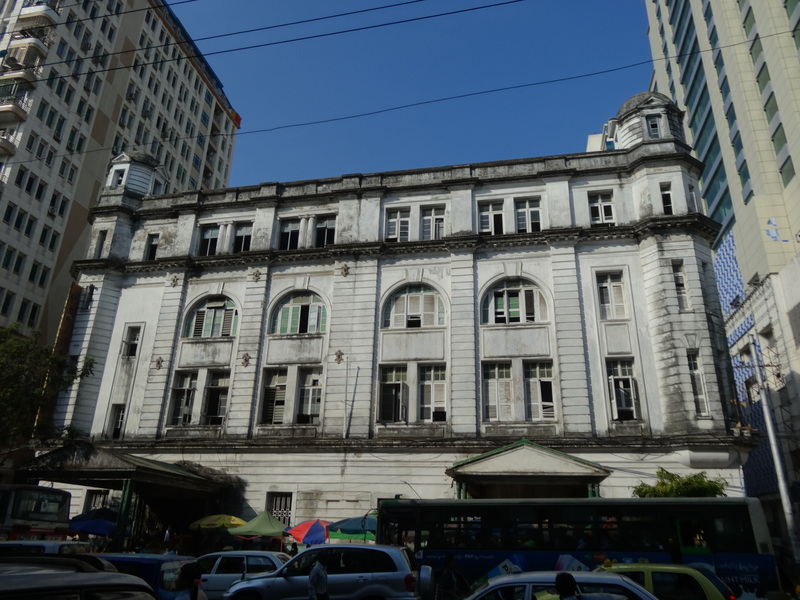 Other buildings with beautiful window panes and a moss-covered hospital are harbingers for what the past was in this teeming, lively city. 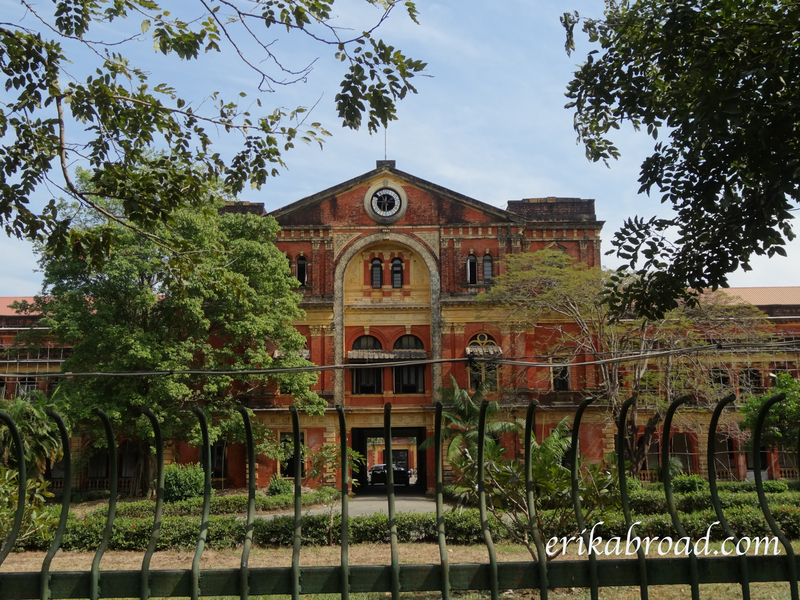 Once my tour finished and I parted ways with my guide, I discovered some of the most remarkable buildings Rangoon had to offer: former government offices. These were the kinds of buildings which you could see in a movie and not believe they truly exist. Bracketed by rusted fences and barbed wire and surrounded by palm trees, these British-built behemoths boast broken clocks, shattered windows and ornate craftsmanship. 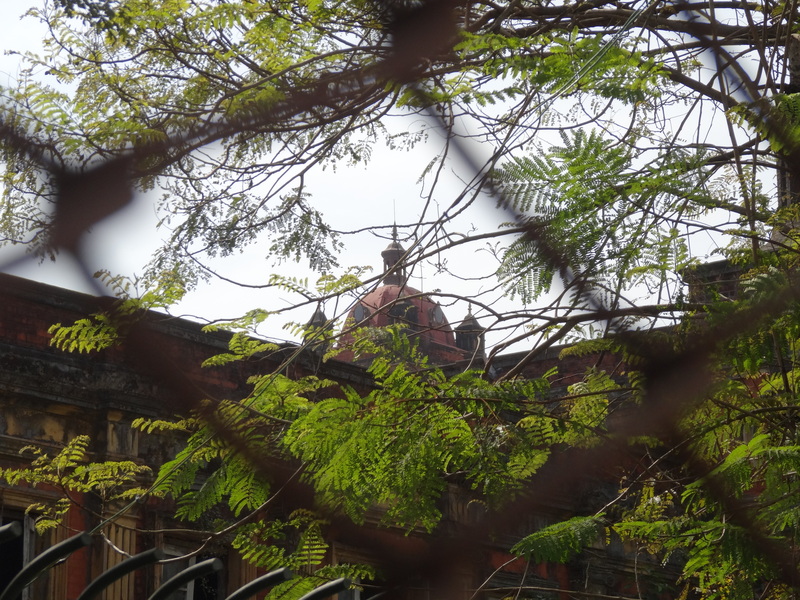 While the facades may be dirty, the omnipresent sound of hammers and nail guns indicate the beginning of restoration work. 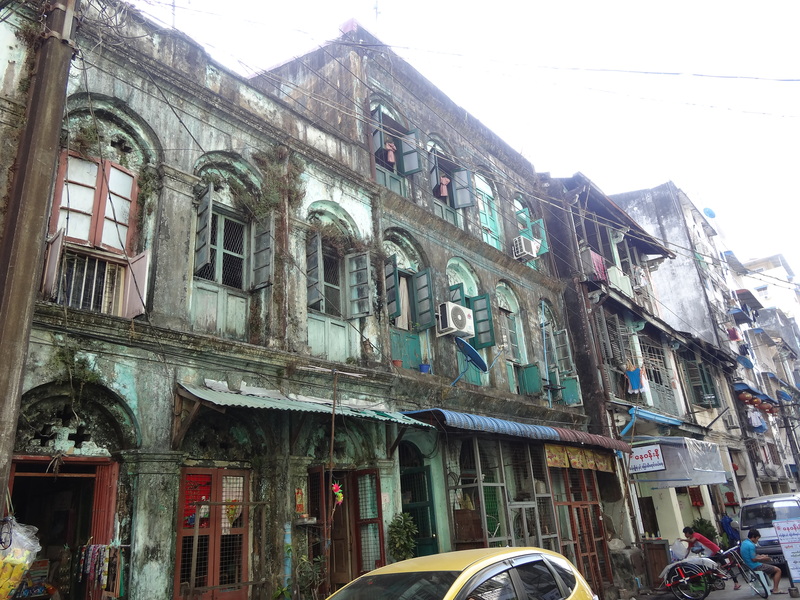 My biggest hope is that I can return here in twenty years and see how the buildings were beautifully preserved for future generations to enjoy. 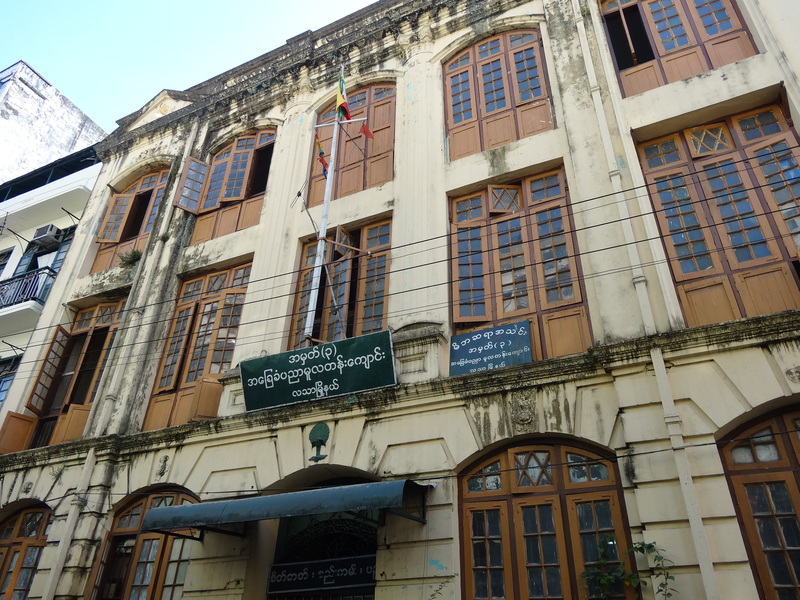 First up on the list of these buildings was the Minister’s Office, a.k.a. The Secretariat. The photos will describe what is very difficult to do with words. 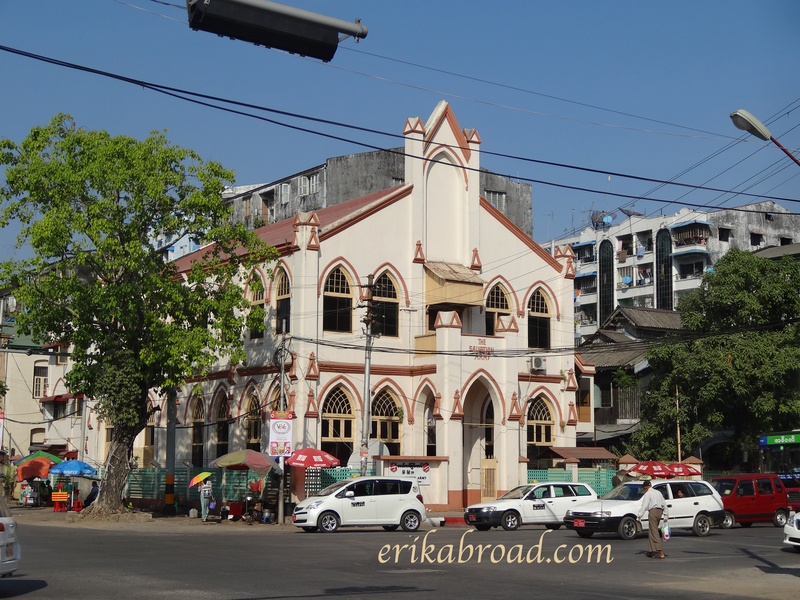 In the same vicinity, I encountered some other colonial buildings: an old Anglican Church transformed into a Salvation Army location. 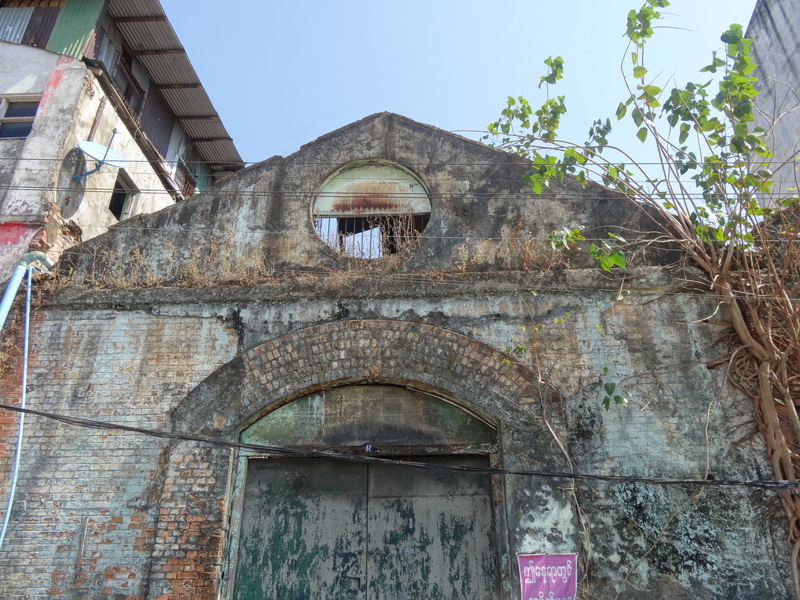 some other buildings that had to be involved with heavy industry in their heyday. 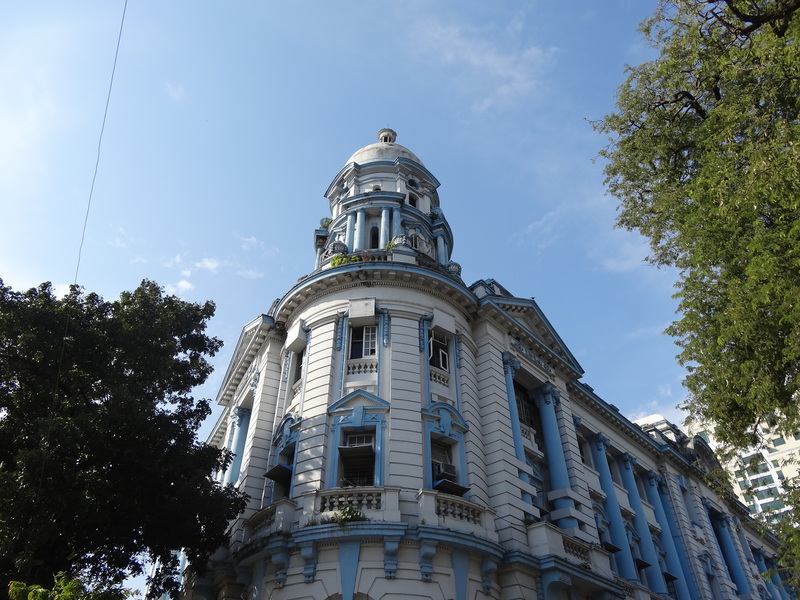 I thought I had seen the best of the city’s colonial architecture, but I had not seen anything yet. 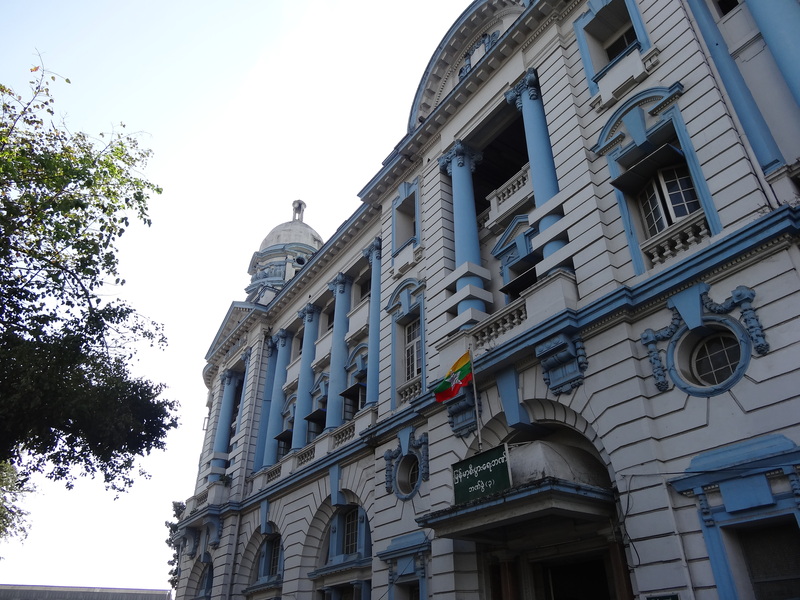 Standing in front of City Hall, I quickly realized that the High Court building would become my favorite piece of colonial architecture in the whole world. This 1911-built structure has towering red and yellow-brick construction. The famous British royal lions wait in various locations across the roof line, as well. 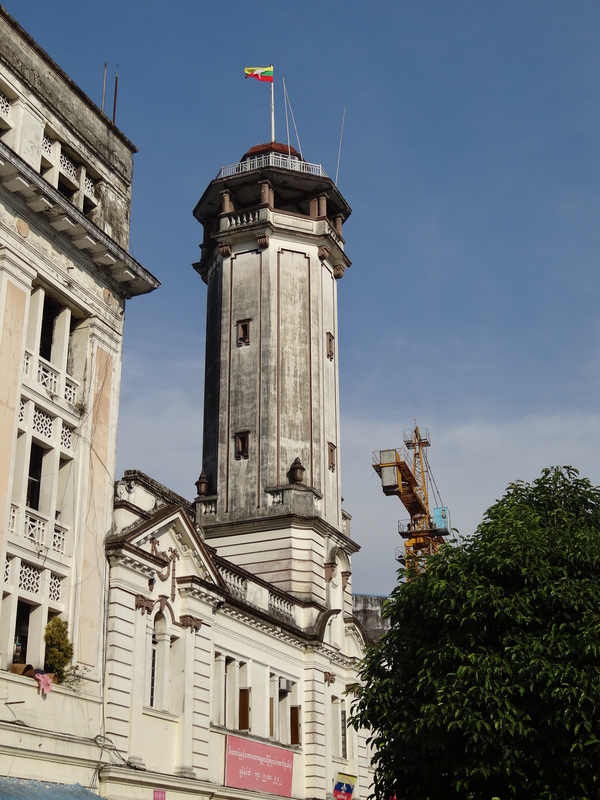 The imposing clock tower and facade show that this was the seat of British power in colonial Burma. 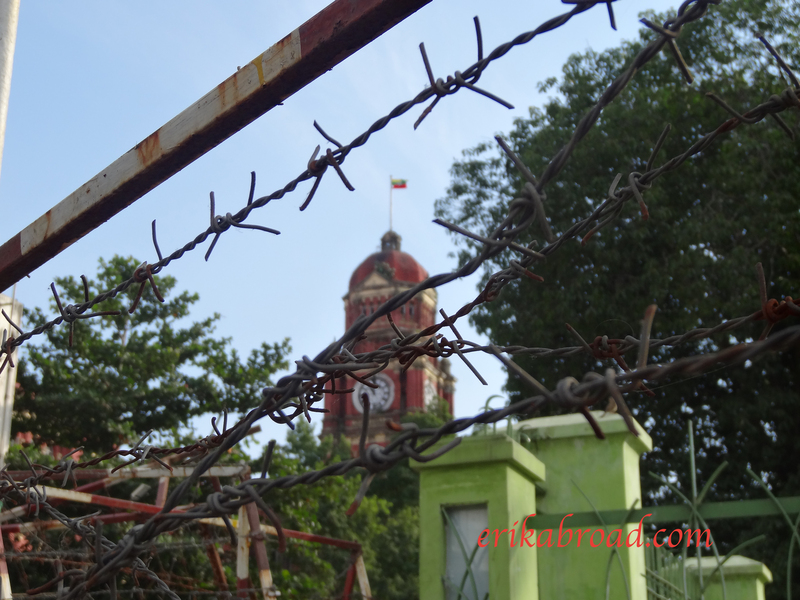 As one walks away from the High Court building, there are many layers of barbed wire. 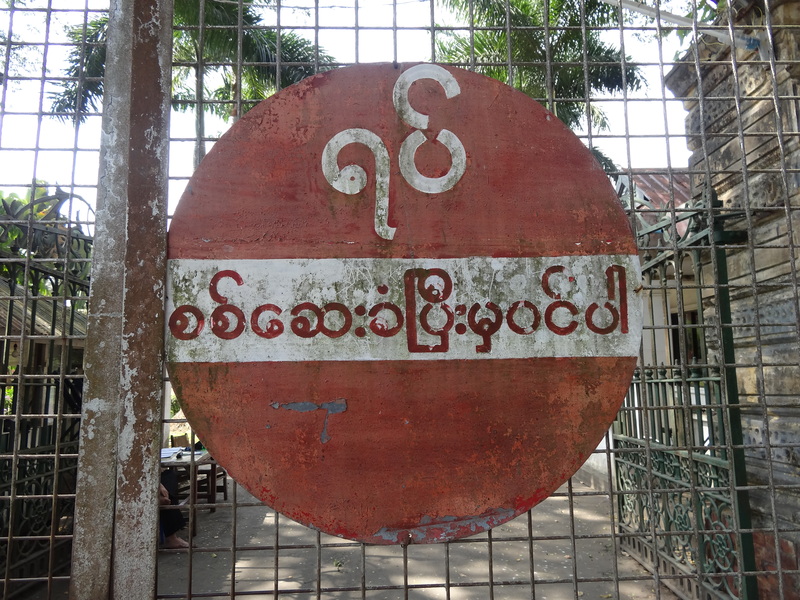 This provides a unique scene which is representative of Burma pulling itself out from under decades of military rule. 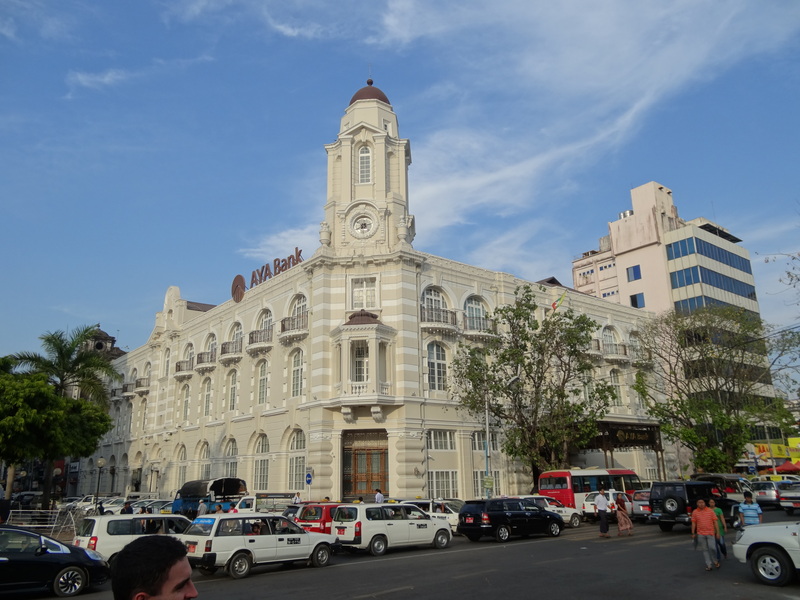 As the tour continued, we encountered other spectacular colonial structures: The Sofarer’s Building, which was home of the finest cafe in the East, Vienna Cafe, at the height of British rule. 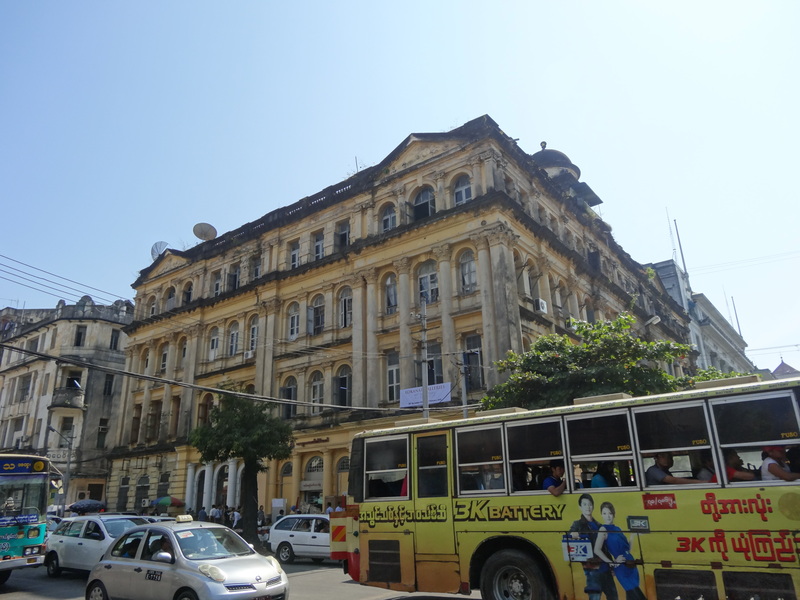 The former headquarters for the Irrawaddy Trading Company has an elegant interior which reminds me of some ritzy hotels in Manhattan. 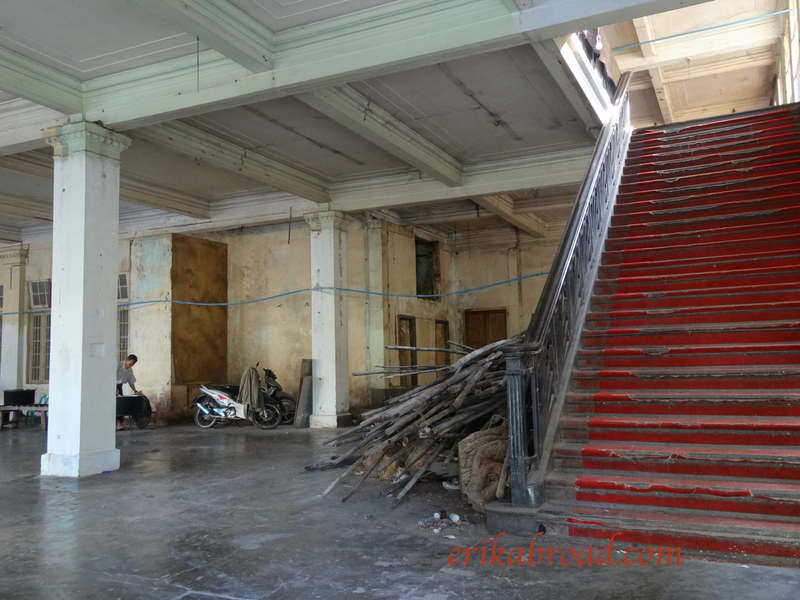 Its staircase would not be out of place at somewhere like the Waldorf-Astoria. 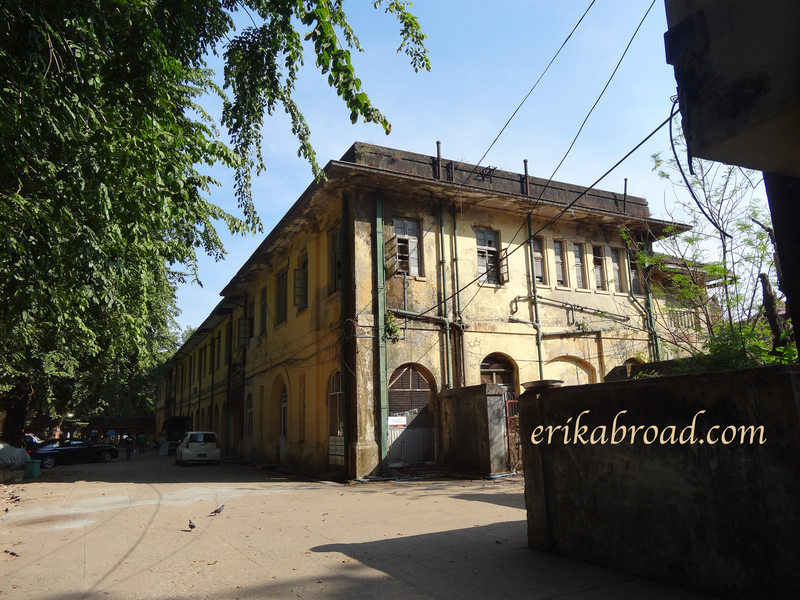 We continued on our tour towards Pansodan Road and encountered even more colonial buildings. 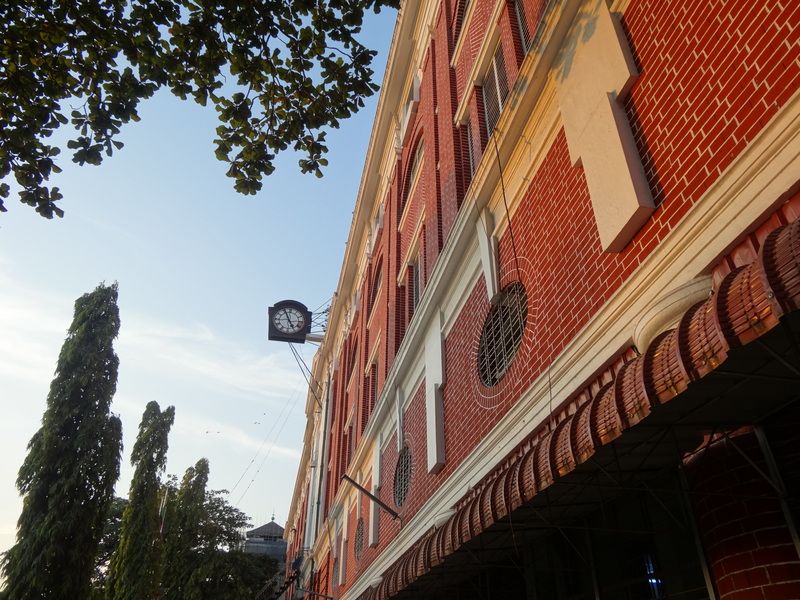 The Accountant General’s Office and Currency Department was first. 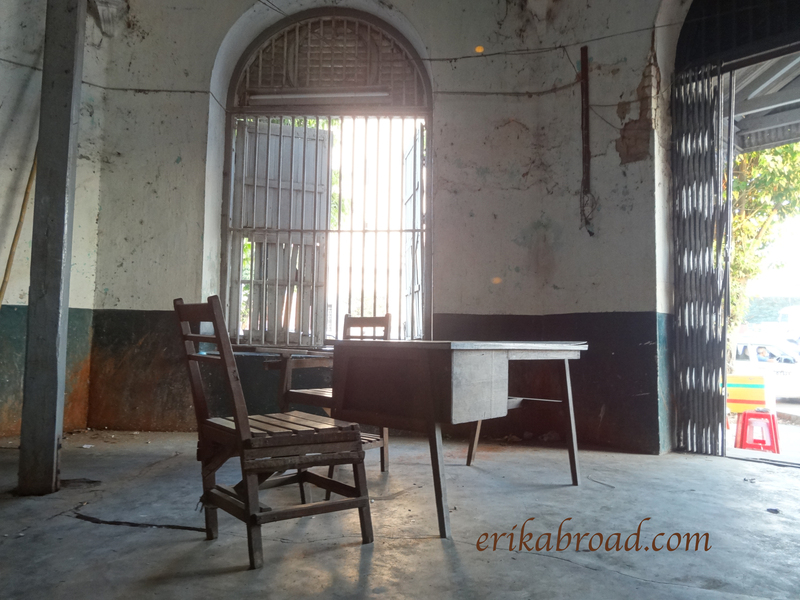 Inside, prisoners are sentenced, fined, and then hauled off to jail was my favorite building on this section of the tour. 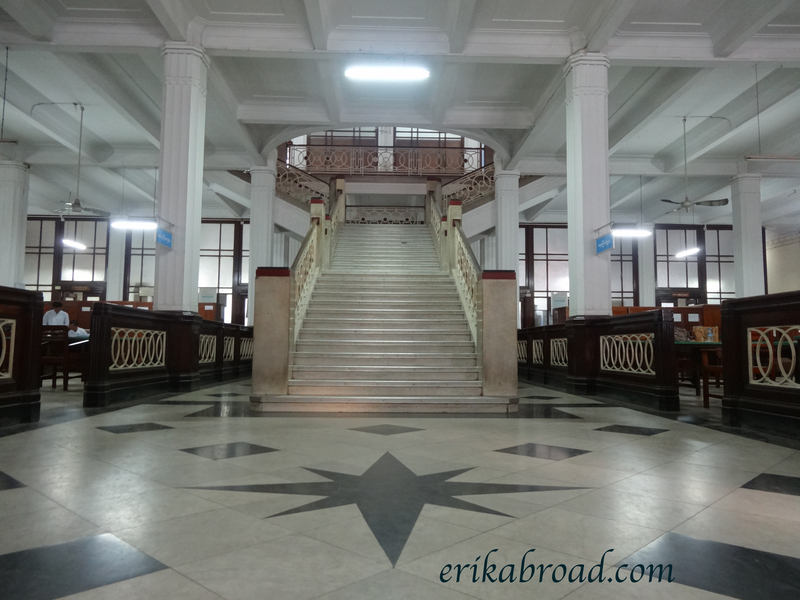 We stopped to see the General Post Office, which boasted a beautiful colonial interior. As the sun started to set, we walked past the Strand Hotel towards the Custom House and other various buildings. 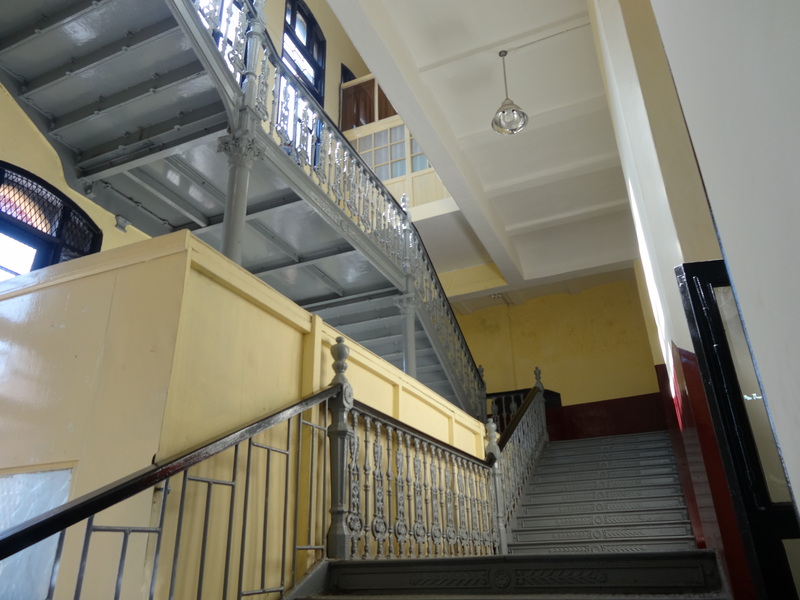 The tour concluded back at City Hall, where the former Rowe & Co Building has been turned into a bank which overlooks the Burmese independence plaza. 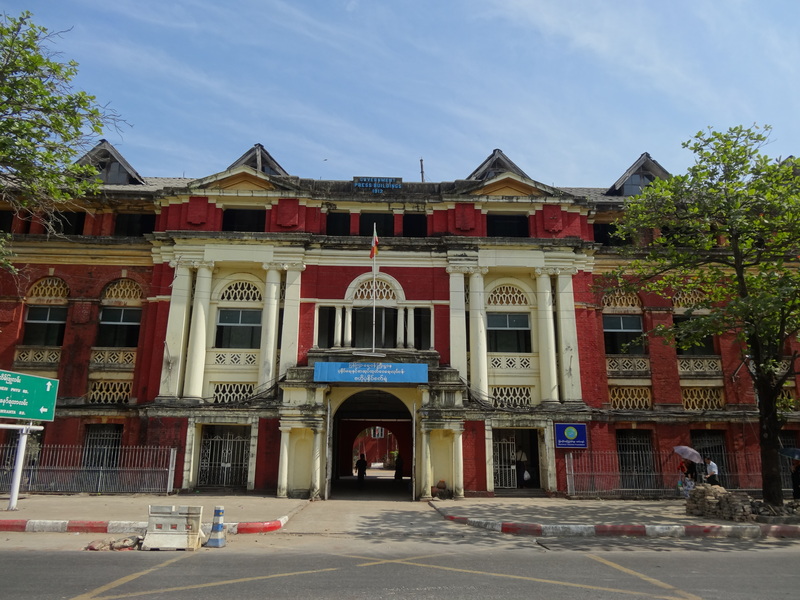 Two days later I returned to Rangoon following a day trip to Bago and continued to explore the city and see what other colonial buildings I could find. I was not disappointed. 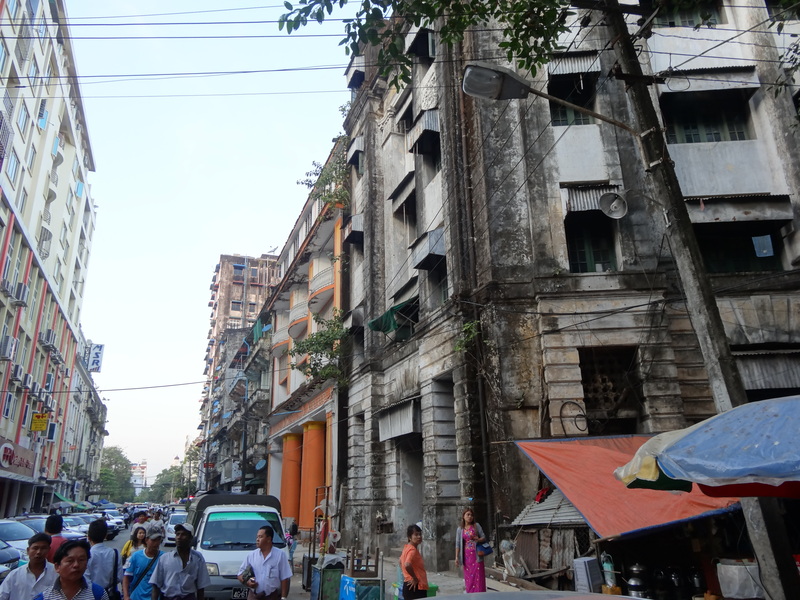 Walking through the streets, I encountered several more dilapidated colonial structures and others which were under construction for massive renovation and restoration. 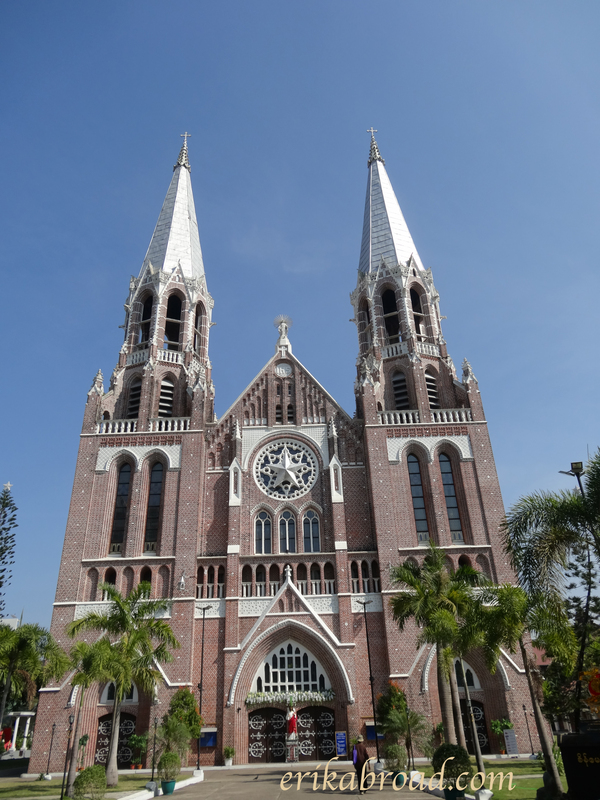 Of course, there were also some beautiful churches to be seen. 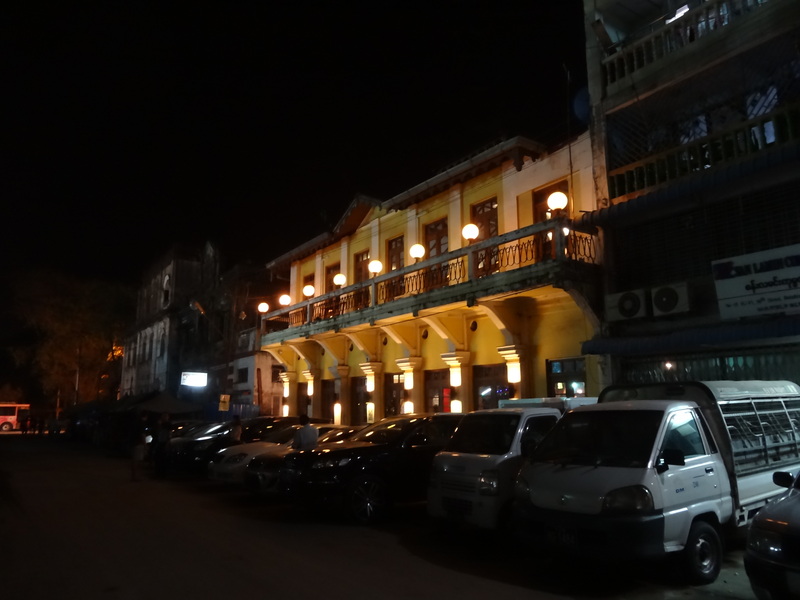 As nightfall came and I had a drink at 50th St. Bar, which is a renovated colonial townhouse. As night fell and so did my eyelids, I stopped to see City Hall one more time. The exterior was lit up in green and red to commemorate Christmas Eve. 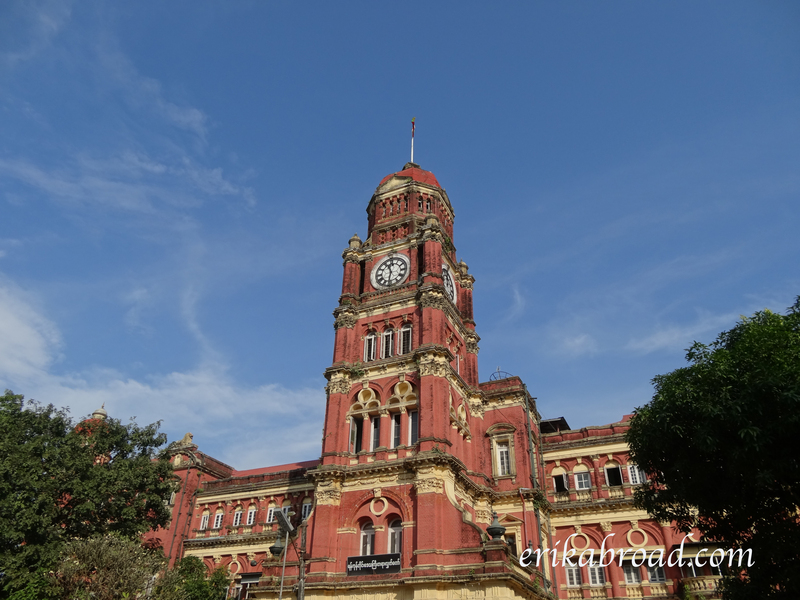 As you have seen by these photos, Rangoon is the most beautiful city “Somewhere East of Suez” in terms of the rich colonial architecture and history it possesses. 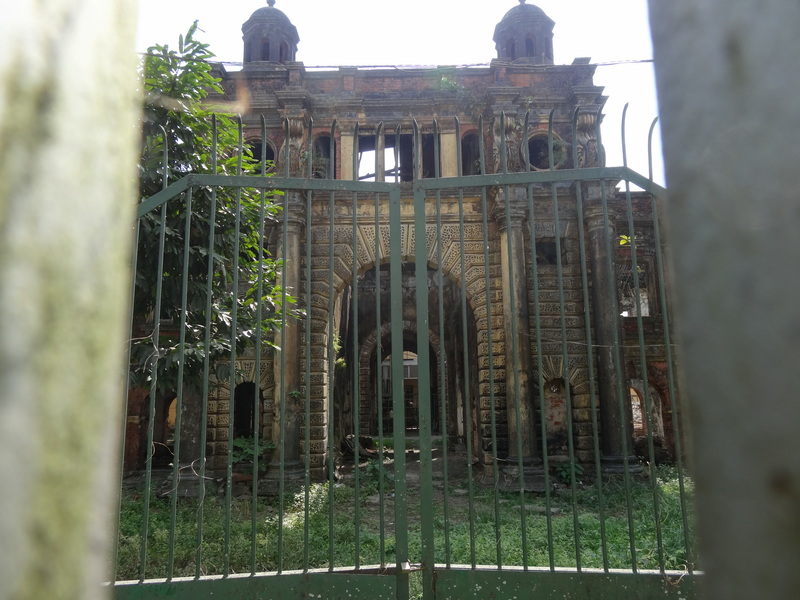 Over half a century of neglect has left many of these colonial and historical structures in or very near disrepair, but there is hope. 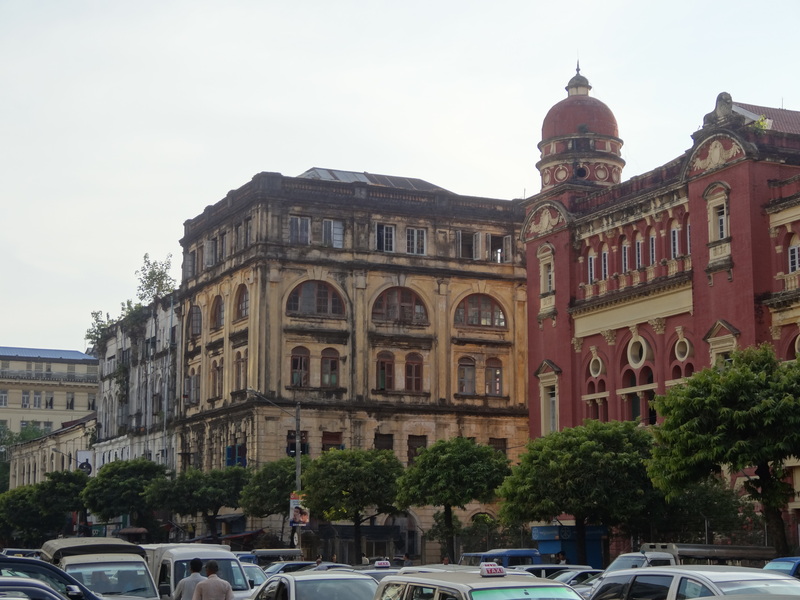 New influxes of cash from the Japanese and Indian government could help revitalize Rangoon and save some of these buildings before they are lost forever. 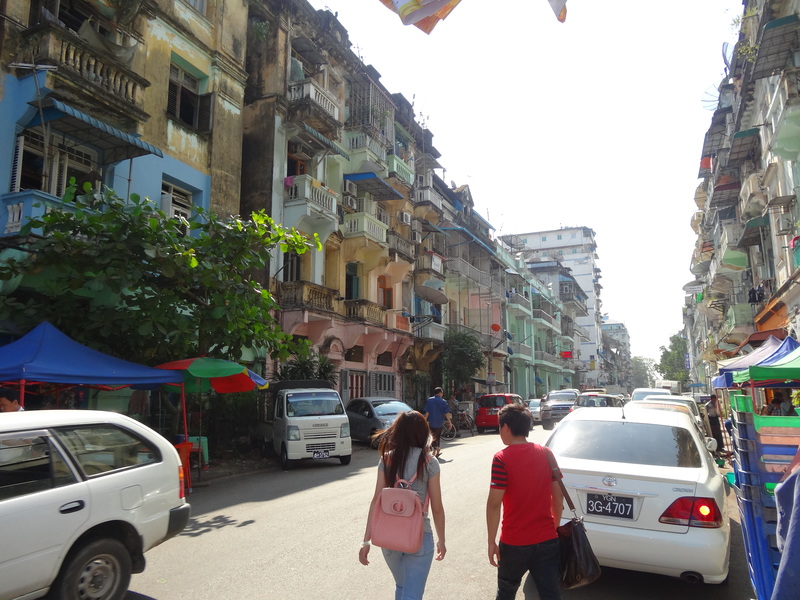 It is very interesting to venture into a city this large while lacking McDonald’s, KFC, and even Seven Eleven. 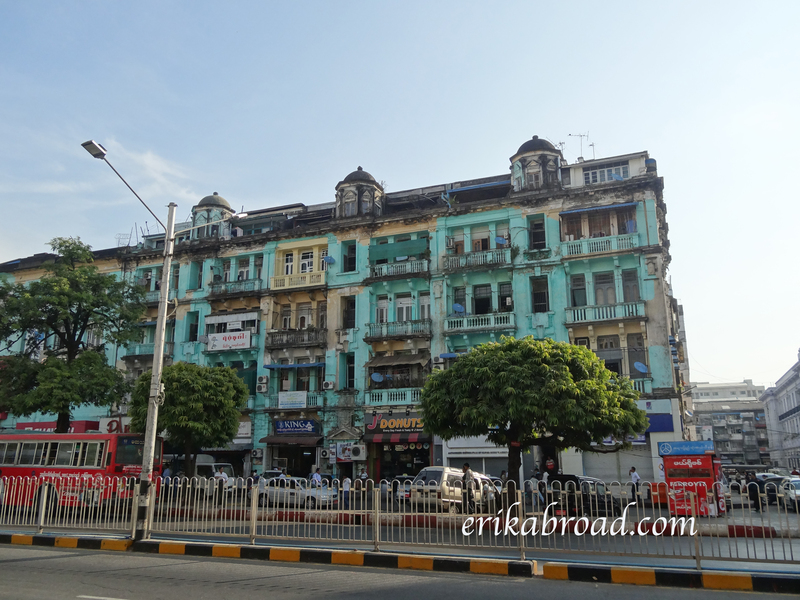 If there is one place you should go in Asia as soon as possible, Rangoon is the place. 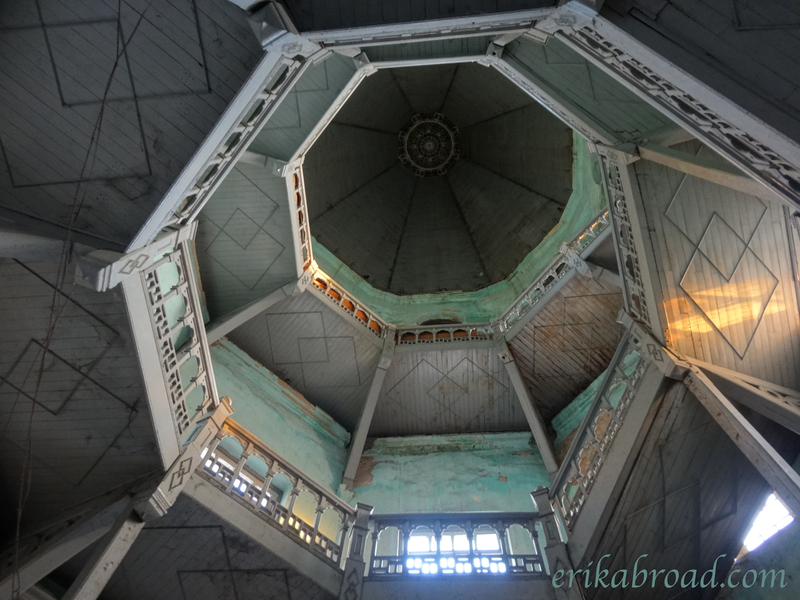 Get there before these buildings are claimed by time, skyscrapers, or neglect. You will not regret it. The smells, sounds, and energy of this city point toward a bright future. 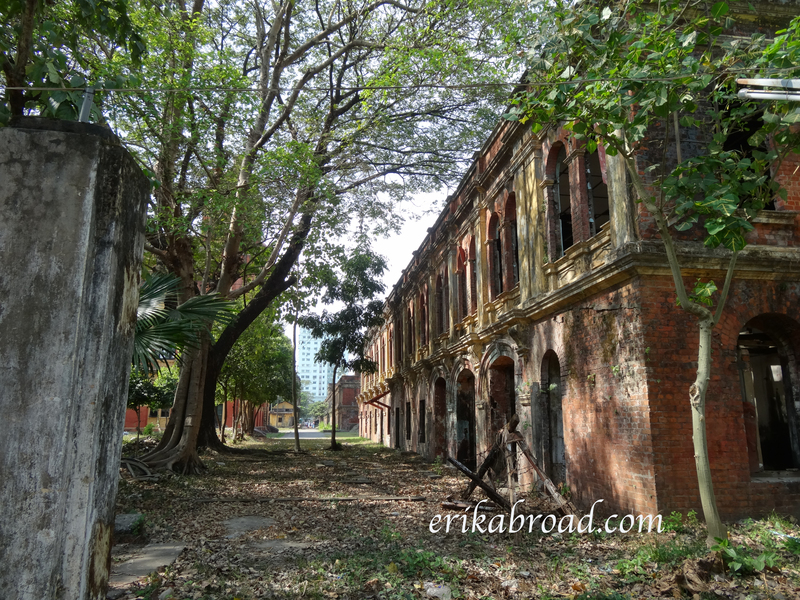 Hopefully the past is not forgotten or destroyed in this time of development and growth. 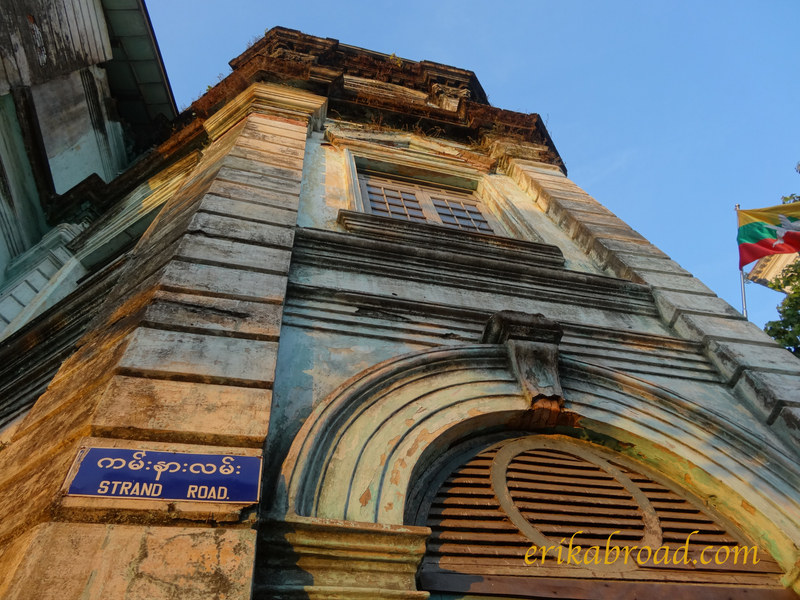 Go to Burma and experience the best colonial architecture in the world before it is claimed by Father Time. Erik, I enjoyed the tour. This morning it was 3 degrees as I took our Scottish Terrier for a brief “morning walk.” Continued enlightenment for you in your journeys. Erik, your dad sent me your photo essay. Thank you so much for sharing your passions with us. It does indeed look like an intriguing city. Continue to be safe in your journeys.